So this is just perfect! I like it!! Thanks so much!! Thank you dear Tunde, I thought this had to be one of your excellent games. Super as always. Thanks a million for this great idea. 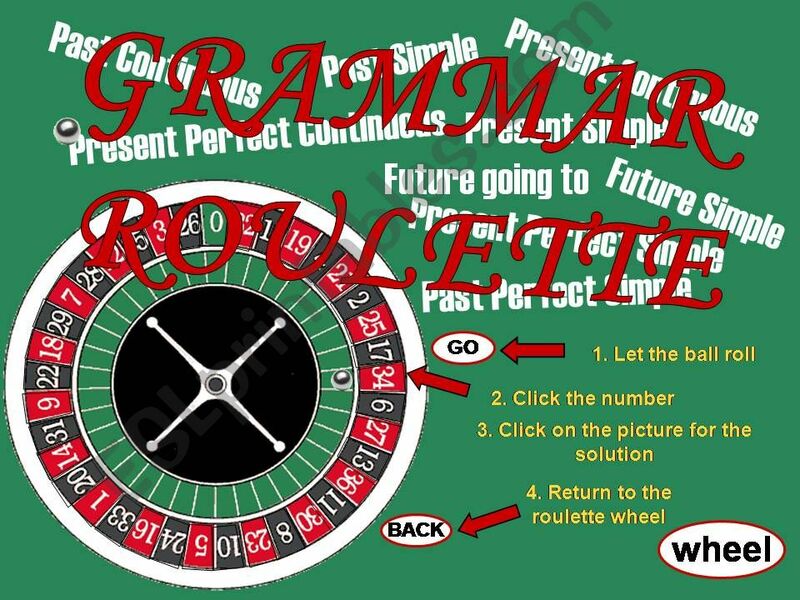 There was a sound effect of the roulette wheel spinning and the ball rattling, but somehow it got lost while uploading, if any of you need it I can send it via e-mail. Have a nice day and thanks for your comments. Great work!!!!!!!!!!! Thanks for sharing!!!!!!! Thanks a lot for another fantastic ppt!Have a nice week! Thank you so much for your perfect work! My pupils will love this. Thank you for creating this powerpoint! This is so creative and fun! Nagyon szuper!!!! Thanks a lot! I have no idea how you made this in PPT! Well done! Thank you so much I think my students will love this. Thank you so much, this powerpoint is very well done and very useful ! Thx a lot ! Thank you very much for sharing this game. bet my students will love it... I do!